Hello, and happy Friday! When I opened Google Classroom today, I wasn’t expecting anything special. But – that’s typically how things go with Google and their updates to Classroom. You open the site and get ready to share announcements or post an assignment and ~BAM!~ Google tosses an early Christmas present your way, and it makes your day! Google recently unveiled a new and improved Classroom. It’s much cleaner – easier for teachers and students to navigate with a separate section for announcements and assignments. However, many teachers, myself included, desperately missed the traditional “About” section of Classroom. While “About” is still available on the updated version of Classroom, it doesn’t offer the ability for teachers to post content. NOW … teachers can add “Materials” to the classwork section of Classroom AND, using topics, post the materials with other assignments for each unit. WOOHOO! The newest update also provides teachers with the option to add a classwork stream to any Classroom sections they created prior to the recent changes. Hello, and happy Tuesday! 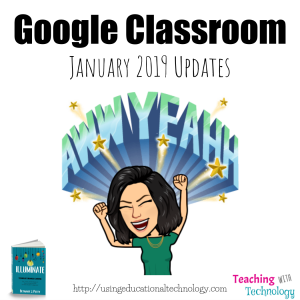 In case you missed it, Google announced today that they’ve made some great improvements to Classroom, hopefully making it more user-friendly and efficient for teachers and students! 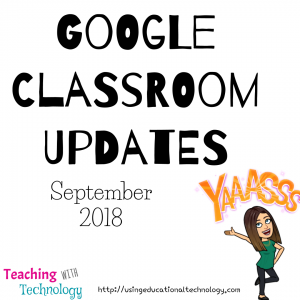 Let’s dive right into the updates to Google Classroom. Do you ever look at an update from a tool that you love using in your classroom and think, “YAASSS! This is going to be so much better!” That’s exactly the response I had when I noticed this change in Classroom. One of the chief complaints that my students have while working in Classroom is that everything is too “smushed” or “jumbled” because assignments, announcements, questions, etc., are all in the same spot. And, prior to this update, I totally agreed with them. Yes, I used the “topics” feature to make locating resources, assignments, etc., easier, but the fact that everything was on the Stream was just a bit too much. N ow, Stream and a new tab “Classwork” are two separate entities within the Classroom section, allowing for teachers to create assignments (and soon, locked quizzes! ), questions, and topics (used for units) on the Coursework tab and announcements on the Stream tab. Woohoo! Perhaps my favorite update to Classroom is the grading feature. Teachers can now open student work through Classroom and toggle back and forth between student submissions without opening new windows for each individual student submission. As you can see in this article from Google, teachers will be able to open a student submission, add comments (and even quickly add often-used comments! 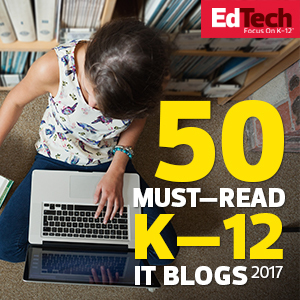 ), and move to another student’s work without opening a new tab. WOOHOO!!! Ok, so I know I just said that the grading/feedback option was my favorite, but the new Topics option is a close second … maybe tied for the favorite spot. 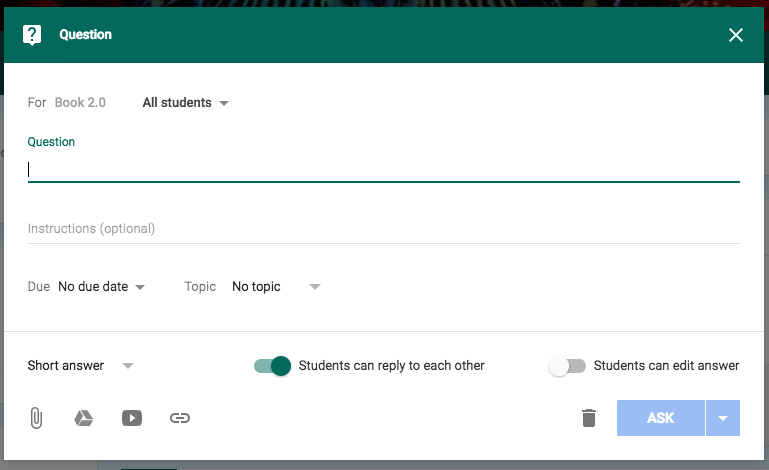 The Topics feature has been around for quite some time in Google Classroom and has done wonders for “cleaning up” the sometimes messy Stream. NOW teachers can use Topics to create units in the Classwork section – almost like folders where students can easily access all of their work and information for a given unit. WOWZERS! Check out this GIF for more details. 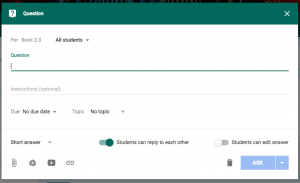 Long story short – I am PUMPED about the new features that have been added to Google Classroom. Soon, teachers will also be able to assign a Google Form as a quiz through Classroom (on managed Chromebooks) in “locked” mode – I can’t wait to see how this works! I love opening Google Classroom to find that Google has added MORE fabulous features to one of my favorite programs! view a list of individual student work. By simply selecting a student’s name, teachers can not only see a list of the work that was assigned and the status of that work. Teachers can also email students and their parents/guardians directly from this page! 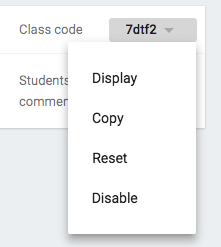 enlarge the class code to display. This will prevent me from having to enlarge my Chrome browser to 200% or constantly repeat the class code while my students are joining their Classroom section! to reorder class cards on the Classroom homepage. This is a welcome addition to Classroom, especially if you’re like me and you like to have your classes displayed in the order you see the students during the day! Teachers can also transfer ownership of Classroom sections and award partial points for student assignments! 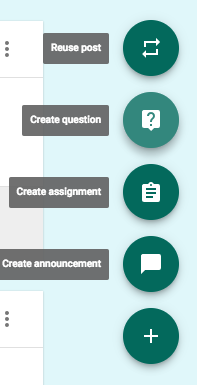 I LOVE opening Google Classroom and noticing new features! It’s like Christmas morning, Google Classroom edition! On another note, I’m hard at work on my new book, Using IT. My goal is to be finished writing before school begins … in about 3 weeks … and for it to be published early next year! 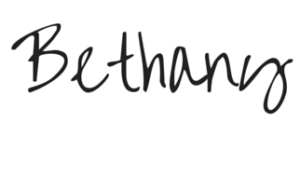 Be sure to join this mailing list to receive updates from my book! 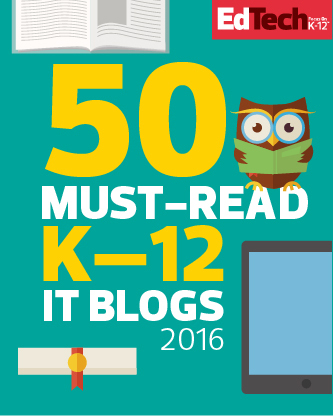 Create a Class Blog with Google Classroom! I LOVE blogging! I love love LOVE it! You have no doubt picked up on this fact if you’ve been reading my blog (thank you!). My blog gives me a way to express myself to an authentic audience, reflect upon my teaching experiences, share my triumphs and struggles from my classroom, connect with and learn from other educators around the world, and provide resources and strategies for other teachers. I LOVE it. I want to be able to offer my students the opportunity to contribute to a class blog because I see so many benefits of students blogging! If I were using the “old” version of Google Sites, creating a class blog through the announcements template would be a breeze. However, even though the new version of Sites is stunning, I’m missing the announcements option! Enter Google Classroom! Google Classroom has become an essential feature of my classroom. Classroom serves as our landing page and houses Docs, Slides, Forms, important websites, announcements and other resources that my students need. I create a Google Classroom section for each class period and archive those sections at the end of each year. There are MANY ways to utilize Google Classroom sections – some may create a section every quarter, some for every unit, and some may use the same section year after year. That’s part of the beauty of Google Classroom! Teachers can use this fabulous tool however they feel it will best benefit their students! Now … to the class blog project! My American Government classes have a gamified component – a huge motivator for some of my students is the chance to earn Bonus XP. I plan to create a section in Google Classroom titled “Bonus Blog” (or something else that’s more clever!) and will have all of my students join that section. Throughout the year, I’ll use the question feature of Classroom to create a variety of blog topics and will encourage all of my students to participate in our Class Blog. How will I choose topics to include on our Class Blog? By surveying my students, of course! I’ll create a Google Form to solicit responses and view the data on a Google Spreadsheet. Forms and Spreadsheets make my Google-heart happy! I also plan to create free-choice questions on the Classroom section to encourage students to authentically reflect upon whatever they want to share! I tried the concept of a blog using Google Classroom with my online Tech for Teachers course this summer, and IT WAS AWESOME! I loved how easy it was to view and respond to student blogs, and I am so excited to use this activity with my students this fall!